We have two cats and yet rarely get hairballs at our house. Our cats are short-haired, but 1-2 hairballs total per year is very few indeed. I have an old cat care book that says one hairball per week is not unusual, but I now think that 1+ hairballs per week is not normal. So I must say this first: I have seen IBD– or worse, intestinal lymphoma (cancer)—turn out to be the cause of frequent hairballs. So if the following tips don’t work for your cat, please get a full vet exam. It could save their life. I now believe that grain-free may be the cure for hairballs for most cats. So many reports of this! I would try it first, because anything else is just a bandage–not a cure. That means find foods with no wheat, gluten, barley, rice, corn. 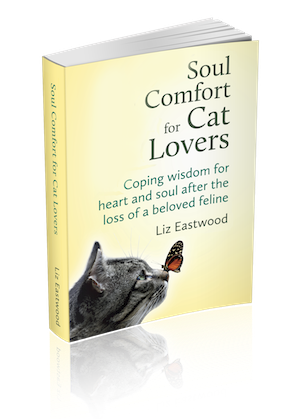 See this article by Fern Crist, DVM and Dr. Elizabeth Hodgkins’ book, Your Cat: Simple New Secrets to a Longer, Stronger Life and this article by Dr. Becker. Additional prevention remedies that worked for us also happen to be recommended by Dr. Karen Becker. Probiotics/enzymes mixed into wet food. When we aren’t feeding raw food, we add this probiotic/plant enzyme mixture designed for animals. Vets Best Hairball Relief (Chewables) are natural, designed to be tasty for your cat, and popular at our local holistic pet store. Our cats love the taste, and the ingredients include Slippery Elm, Psyllium, enzymes, and other natural, safe ingredients. I must wrap up by saying again: If these tips don’t work and your cat is throwing up hair too often, please get a full vet exam. It could save your cat’s life! Do you have a natural hairball remedy success tip? Don’t hold out—please share in the comments. GIVEAWAY: Which of these books do you want to win? This is the first time that I heard of trying a grain-free diet to eliminate most hairball issues. I have been adding pumpkin to her food for the last month and it seemed to help at first but recently she has been coughing a lot and trying to bring up hair balls with no success. She is eating ok and has good energy levels but I feel bad for her every time I hear that cough. I just need to find a good dry food that is grain free and still healthy and affordable (and that she will actually like). Thanks so much! Bock Vet Pharma has a revolutionary hairball product Capilex available only through veterinarians that is very effective in controlling hairballs. From their website “Capilex gently breaks down the hairball, allowing the ingested hair to pass naturally in the stool. The food previously trapped in the hairball can be digested and made nutritionally available to your cat. Capilex does not contain petroleum by-products, such as mineral oil or white petrolatum, which can be found in other hairball remedies. Capilex does not require a diet change or rely on fiber for its effect.” I know a holistic veterinarian who strongly recommends this product in her practice. My 12-year-old kitty used to have hairballs about 2 times per month, then he became worse, throwing up and having hairballs twice a week. I took him to the vet, where he was prescribed a bland RX diet to soothe his tummy, which helped for a while but not permanently. Is it just me, my cats seem so fussy. I am trying to convert my cats from Dry Raw, the holistic vet suggested switch to canned, then to cooked, then to raw. After spending a fortune buying virtually every brand available they will only eat two(and this is four cats! all in agreement). they will only eat wellness chicken & herring and natural balance kitten. nat bal kitten has rice-not good and both have carageenan as most do now. One of my cats has swollen lips, what the vet is giving so far not helping, could this be from carageenan? By the way the dry they were on was grain free. Also the two older cats seem to get dry noses allot now, I used to give felvolitte ll vit supplement and it always worked now it is not available in canada, liq vitamins must taste bad, id added to food they wont eat it. I am giving digestive enzymes & probiotics powder in the soft food. Is there a tasteless powder vitamin? This process is slow and getting only two brands of canned may not be good, tried one of their cooked recepies but it has soo much applesauce and blueberrys thought it was weird, and they wouldnt touch it that was R16 hilory,s recepie. I’ve heard really great things about RadCat for raw food. And cats need much higher doses of probiotics than the ones made for cats. Use human grade probiotic and split a capsule into two doses and give twice a day. Carrageenan is a NO NO for my cats. There ARE canned foods out there that do not have it but you do have to search. And you are right – cats do not need applesauce and blueberries! My husband has used human grade probiotics with one of the cats, and it actually turned his health around and at a very critical time! It cleared up his diarrhea and helped him put weight back in and get back on his feet. That being said, I understand what you say about it and the difference between the two. This particular cat also liked the canned pumpkin. I guess I should give it a go with my bots who are currently having trouble with furballs/hairballs. After reading your post about carrageenan, I looked into it and found out that there is controversy surrounding it. According to the FDA, it is safe for human consumption; there are also two different kinds of it. It is also known as a possible carcinogen to humans by the Cornucopia Institute. I don’t trust the FDA and its standards. I also read that it is known to cause GI tract ulcerations and cancer in animals. You can order pet foods from Amazon! I order Wellness on a rotating basis. A case comes to me every month! I read olive oil was bad too. Mine doesn’t like coconut oil tho. She just left a hairball today and thought it was a mouse. I didn’t realize kittens didn’t get hairballs much, she will be two in December and is a medium long tuxedo. I’ve been giving her a bit more dry Wellness and treats so that may be it as well. She’s slim as well, she has free access to the in and outdoors and wasn’t fed as a kitten, I know her dog brother wasn’t..
What about grapeseed oil? Has anyone tried this? Where can I get Slippery Elm just by itself? I have Willow Aid natural aspirin for myself but I don’t want to give it to my cat without knowing how the rest of the ingredients might affect him. Anyone who has experience with this, your feedback you could give would be appreciated. What about just giving me cat a small can of wet food each week or every other week? All my pets eat dry food and to give them wet food gives them loose stools, so I don’t want to give too much of it. I can’t predict when the furballs — or hairballs — will come, si I’m sort of at a loss. Thanks again and I will look for your assistance. I have Willow Aid natural aspirin for myself and I don’t want to just grind it up and put it in the cat food as too much causes loose stools. Also, because it has other ingredients, I’m hesitant to just give it to Kitty or Doggy before knowing what affect it might have on them. I’m not sure about the canned pumpkin either, because some like it and some don’t… and again the loose stools. Thanks again, and I will look for your feedback. I’ve heard different things. I know some people have said that olive oil is bad for the cats, and others have said it’s good. So I’d recommend doing some research. I have a hairbally cat in the household (13 years) and a diabetic (17 years), among others. My problem will be how to persuade the finicky hairbally cat to eat pumpkin without her donating (or regurgitating) this high GI treat for her (greedy, opportunistic) diabetic sister. Anyone done any work on the GI effects on pumpkin in cats? I am looking for guidance. I have a 7 yrs old cat and she has OCD yep that is what the vet says she has an obsession with licking herself and gives herself rashes or hot spots I guess on her belly and most of her fur is gone from her belly. The vet says there’s nothing really we can do because we may never know the reason why she is doing it. Instead of using their steroids and creams I did lots of extensive research on using coconut oil as a natural product to put on her hot spot to cure her. I have to say in only 2 days there’s already an improvement. Question: The only problem I see is she is starting to throw up way more like 2-3 times a day usually a bit of yellow or white. This doesn’t concern me but it does when she does this so often. I am not putting lots of coconut oil on her sores but I am assuming once I leave her cone on her head for approx 2 hours or so to let the oil soak in she then licks it. TJ, no it’s not normal for a cat to throw up that much. I would guess it’s either an uncommon reaction to the coconut oil, a medical issue, or a food reaction – did you change her food recently? Oh, I also wanted to say that often the OCD licking stops when the cats environment becomes less stressful to them – and that in many cases when the human stress diminishes, the cat’s stress diminishes. With the licking all the fur off the belly–I had a cat who did that, and the vets didn’t figure it out until another cat also started missing fur. They tested negative for mange, and were indoor cats, but somehow they’d picked up fleas. They were so clean there was almost no evidence of the fleas, I never saw one or got bit by one, but the vets found flea poop in their fur when they looked very closely, and flea medication made the hot spots go away. If the fleas ever came back, the hot spots would come back too. I would get your cat checked for thyroid disease and also IBD or Triaditis disease. Many cats with these issues lick their fur excessively or even pull chunks out. They do this because something inside is not right. I realize this reply is a few years late but I was out here looking for a natural hairball remedy. I saw your post about your cat licking all their fur off, and throwing up. I have a cat who used to do the exact same thing. She would lick off all her fur wherever she could reach to lick. She looked like a ragged alley cat. A sweet, lovable, snuggle-y alley cat. We would give her a long-acting steroid shot every month, and sometimes during a very bad times a secondary short-acting steroid. This would do the trick but I was very concerned about the long-term effects such as diabetes. Two years ago, at our wit’s end, we had an allergy panel done on her and the results were startling. We like to say she’s allergic to everything but air! We started her on allergy shots (2 different formulas – one for fungi and one for all other) and the results have been astounding, to say the least. She is fully furred with the exception of her tummy just being fuzzy. Seems like that will never fully grow back. She now only licks when her shots are due, which at this point is bi-weekly. The shots start very frequently but over time they are become less frequent and bi-weekly is the best schedule for our girl. The other thing we did was overhaul her diet and eliminated all things she is allergic to. We became champion label readers. Our other baby got the benefit of eating healthier, too. I hope your kitty is doing better and hope this reply benefits another kitty’s human. Obsessive licking and/or skin issues are frequently signs of food sensitivities. Tricky to diagnose, because foods can give issues days after eating, rather than right away, and can last for weeks… though issues should taper off during that time. Aim for healthiest possible, cat-appropriate diet. Mine seems to react to various kibbles, but is doing okay on Wellness brand wet food mixed with raw chicken-veggie pucks. Hi there, my cat is 10 years old and I think he may be having a problem with a hairball. I’m not sure what kind of remedy to give him since he has stage 3 kidney disease and I need to be very careful not to give him things with too much protein, and also can’t give him stuff with salt. The coconut oil sounds like a good idea but if anyone knows of a specific low-protein, no-salt hairball remedy that would be great. My vet won’t offer advice without me bringing in my fuzzy buddy, but vet visits really traumatize him and I can’t afford vet bills right now either (working two jobs and barely making ends meet). Any advice would be greatly appreciated! I have an elderly cat that couldnt handle a 5 min drive to the vet, I then tried bachs rescue remedy from a health food store in spray format, just one short spray in the mouth made a huge difference! she was vomitting two or three times, make sure you dont get the one for sleep. I also read that coconut oil can cause flu like symptoms If given too much, just like we get after starting antioxidants, I just give 1/2tsp but my cats dont seem to love it, I am giving unrefined organic cold pressed virgin coconut oil. I have 6 cats. The oldest one is a beautiful LH red tortie. One or more of them has, on occaison, thrown up not meely hairballs but a whitish/clear spongy wet gunk. Spooks me a bit. Ii wonder if whoever it is has something wrong with her. 3 are LH and 3 are SH. Ii’ve been trying various anned foods from the local feed store. I had bought, some time ago, a Tasin meat grinder, but somehow it got left behind when we moved. I had been thinking of transitioning them over to raw. My youngest 2 are 11-month-old SH kittens, and they are actually more picky about food than the older ones. For a while, when they were younger, they had a problem with dry eyes. I started feeding them anned salmon, tuna, mackerel, and cooked chicken mashed with tuna, and that seems to clear up their little faces. To me it proved that they really need fat in their diet. BTW, we just moved to another state (Arizona). 2 of my 3 cats sneezes A LOT for a couple days after giving them canned pumpkin puree, even organic. So, i have concluded it’s an allergy since i have tried a few times. I have used coconut oil, which seems to help, but only if the cat likes it. ALSO, Coconuts are high in salicylates, which some people are sensitive too. Some cats might be too. FYI. ~~ I am trying EVOO (olive oil) right now. They seem to like the taste better some days than coconut. the raw food is radcat and natures variety – I use the kibble looking natures variety. Im vegetarian so its less gross for me to deal with!! the Vetri-Science Acetylator looks good/clean but again, if I add anything new to their food, they walk away, I have to really have a lot of the food they like before they’ll eat the stuff that they need! I’m so sorry to hear your kitty is still throwing up even though you’ve tried all these different food options! This may not be a hairball. I would definitely consult with a good vet. I wanted to add to the postings here about grain free diets. One of my cats who is coming up for 13yrs old started to have loose smelly stools, one day I was looking at an email from Dr. Becker, a vet who is associated with Dr mercola and she wrote that cats and dogs shouldn’t eat dry grain filled food. Raw is best. So I switched my cats food to grain free and that fixed the issue immediately! A year or so later the issue resurfaced, after trying many natural dry foods, one finally worked…for about 9 months or so…again the issue arose. I contacted a natural vet and she recommended I stop the dry food all together and go to raw. Of course cats being cats, they wont touch it unless I mix it in their wet canned food. This fixed the issue and everything has been fine for the past month. the raw food is frozen and thawed in the fridge and then served. As im only able to feed them small amounts as they turn up their noses and walk away from the food, I take small portions out and put into small containers, and put the remainder that hasn’t quite thawed completely back in the freezer. So now this morning my one cat with the digestive issues is vomiting about 20 mins or so after eating their raw/wet (more natural) canned food, I fed her again, and it happened, I fed her tonight and it happened again, then I fed her just the canned food, no raw, and so far no throwing up, Im not sure that its the raw food, im thinking its a hairball or the fact that she is eating to quickly. any thoughts? I like the idea of coconut oil, but how much? I hope your problem has improved in the meantime, but if not, I personally believe that our pets can take on our own (unrecognised) illnesses and health issues. A talk with your pet via an animal communicator would be helpful in finding this out. I have had very good experiences with this approach and wish you lots of luck! Or could I just give my girl castor oil? I have some handy, and it certainly seems a better option than mineral oil (if it’s safe, of course), which figures into some commercial hair ball remedies. Hi VP, I am not comfortable with giving cats castor oil because it can be quite dangerous if they get too much (as it would be for us if we ingested too much). Beeswax, I’m not sure – I’ve go no data on that. I too, have recently made the switch to a grain-free diet for my long haired cat. I adopted him from our local animal shelter about a year ago and this summer, presumably because of a heat-induced upswing in grooming, he started developing terrible hairballs. He was having on average one per week, despite regular brushings from me. The switch to grain-free came with almost immediate benefits, his coat was softer and shinier, he wasn’t shedding as much and his litter-box output was, shall we say, admirable. He hasn’t had a hairball since the switch. The best part is he loves the food! My kitty also had occasional outbreaks of cat acne, which have also disappeared since making the switch (I can’t tell if that’s related or not because it hasn’t been long enough). I’ve also been interested in supplementing with a homemade diet, can anyone recommend recipes? I will definitely try pumpkin as a side dish and the probiotics as well, thanks for the tip! Jennifer, that’s great news about the health success for your cats with going grain-free. Thanks for letting us know. 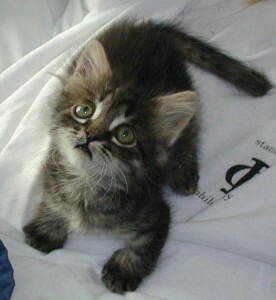 For homemade food I recommend working with feline supplement (AFTER any cooking)- the good ones always include recipes. This way you will be sure your cats are missing anything key. My biggest concern is always taurine, which degrades with cooking and food processing and can be deadly if lacking. By the way, I wouldn’t bother with the pumpkin if everything is going smoothly on both ends already, so to speak! Hello, My kitty actually does have small cell/small intestine lymphoma and we find that the product Acetylator by Vetri Science has helped quite a bit with hairballs and any other GI discomforts. I mix it with her food. Because her GI tract is so very sensitive, none of the oils went over very well and would cause urgent, loose stools. Same with things like pumpkin. Danne, thanks so much for sharing about Acetylator. It looks like a good clean one that includes enzymes and probiotics that would benefit cats with digestive diseases. It’s great to hear that it’s helping your kitty. I am wish you both well. So, when I lived in the US grain free was the way to be…… but now, I am in Mexico. The only food available is dog food of the lowest quality…yuck!!!! So, I’m stuck. Currently my cats are eating oatmeal with vegetable broth and eggs. I have looked at many recipes for natural homemade food, but every one I see has a myriad of ingredients and minerals and supplements that are just not available here. My guys are not too fond of rice… and my options are running out. Chicken is available once a week, so they do enjoy a liver feast every now and then….. But, blahhhhhh…. what else can I do??? Oh, and they are constantly coughing from hairballs. And pumpkin, fat chance! Vet with suitable products, no way!!! Help……..
Nicole, now that’s what i call a challenge! But I am impressed that were able to keep your cats with you when you moved to Mexico. Clearly you love them lots. I’m pretty sure the hairballs are because of the oatmeal. My biggest, first concern is that your cats need taurine – cats can die without it. Trouble is, taurine disappears with cooking, so that’s why cats only get it from raw food or food that was supplemented with taurine AFTER cooking. Can you mail order food? Or at least have friends or family mail cat food to you? If you need to make sure they are getting the right amount of taurine or nutrients with homemade food, I would look at http://www.knowwhatyoufeed.com/RecipeBasicnonmetric.htm and their supplement http://www.knowwhatyoufeed.com/alnutrin_supplements.html or http://www.knowbetterpetfood.com/cat_food_better_in_the_raw. You can use these supplements with cooked chicken, but just be sure to add it after you cook. If available, raw fresh milk from clean, small farms can be very good for cats and will have taurine in it. Same with raw (unpasteurized) cheese. Are they able to hunt outside, or is not a safe area for cats to be out? For hairballs in the mean time, do you have some butter? That might help. For those who live places where they cannot find the pet food they need, I recommend checking into petfooddirect.com. Nicole, I don’t know that they will have what you need, but it’s worth a “look see”. I have used them in the past for my dog’s special food, and I really appreciated the ability to use autoship. I realize I am chiming in a long time after the initial post, but I thought it might help some people. Cats are carnivores, so too much vegtables would not be good for them and especially vegetable broth is not a good idea as it contains onions which are TOXIC to cats. There are many home cooked meals you can make for your kitty using meat and you can order vitamins for your kitty online to supplement. Oatmeal and Vegtable broth are not a good idea for a natural carnivore. Hi Julie, I haven’t yet seen any glaring concerns about propionic acid–it’s apparently a by-product of dairy and used in human foods. But then again, it doesn’t sound all that natural does it? A pure, natural treat that our cats love is Halo Liv-a-Littles. See what your cat’s think! Hi Liz, I appreciate your insights! I looked into the Halo treats and see carrageenan on the list of ingredients on-line at Only Natural Cat. I wonder if they recently changed them? EVO Wild Cravings seem to have fairly decent ingredients. 2 of my 3 cats will eat them. At the store when I read the bags the Herring & Salmon version had some type of bisulfate in it, so I avoided that one. I also notice when I look up the Evo products on line at Pet Food Direct and National Pet Pharmacy, for example, their list of ingredients is smaller than what is on the bags. So it looks like it’s important to actually read the bags vs. what they advertise on line. In general some of the product labels are almost impossible to read with the small fonts and color schemes they choose! I have to say that I love this site! Anyway, I’ve heard of pumpkin but have not implemented it yet. My cats don’t have hairballs really. Although, I do give them the paste on the rare occasion that they need it, but now I will try the pumpkin since I always try and find the natural solution instead. I have given them a tiny bit of coconut oil on some occasions and they really like that, but I try to stay away from that because of the fat. My cats adore grass and I try and give them some daily, so I know that really helps with their digestion and if a hairball is stuck somewhere in there, the grass takes care of it. Marisel, thank you for your kind words! Sounds like your cats are pretty healthy–good for you guys! I have heard of olive oil and coconut oil too, though haven’t received any definitive consensus on those. They just seem to make sense, and I always say “if it works, and it’s not toxic, do it.” : ) Thanks again for your comment. Olive Oil is in fact too rich for kitties and can cause digestive and bowel problems in my experience and research. I’d stick with Coconut or another light oil like Canola or Sunflower for this purpose. Good information Justin, thanks for sharing that. I give my cats coconut oil almost every day (1/2 to 1 teaspoon per cat) since they were kittens. I discovered this accidentally when my girl cat kept trying to lick organic coconut oil off of me–I use it for cooking and as a skin moisturizer. When she was a wee little kitten she had this gagging cough like she was trying to pass hairballs but as soon as she started licking coconut oil the gagging stopped once and for all and I’ve NEVER seen a hairball from either of my cats-thank God. They’re a little over 1 year old now. The girl still is more crazy about it than the boy and never lets me forget, but they both eat it daily. I’ve also seen improvement in their coat-softer and shinier. I also feed my cats raw &canned diet mix and try to go as high meat % and grain-free as I can afford and I definitely avoid dry foods-those cause UTI. The raw grain free diet also definitely helps with their skin and coating and definitely helps keep them normal weighted. The vet took a while to decide whether they were normal or under weight until she weighed them, then explained she wasn’t used to seeing cats that were NOT overweight. How sad! To reply the above comments: one must understand that there are good fats and bad fats. animal fat, canola, sunflower, vegetable oils, fake butter, margarine type oils: bad for both humans and pets. Coconut oil is excellent for weight loss cooking and delicious, so I recommend it to both humans and pets. Good fats help you lose weight. Olive oil for cold dishes, butter and coconut oil for baking and cooking, avocado, eggs, nut butters, these are your good fats. I’ve recently went from being obese to being normal weight by following the logic of replacing bad fats and bad carbs like grains and sugar with good fats and carbs and I always plenty, never go hungry, so I know it’s not just talk but it works and it’s the healthy non-diet way of shedding your excess fat. When to cats, although I have first hand experience they love coconut oil I also have first hand experience they don’t like olive oil or even fish oil that has strong smells-my two kitties anyway. I know there is also scientific evidence on organic refined coconut oil’s health benefits on pets. I’ve also seen less smelly fish oils made for pets in stores. I’ve never tried pumpkin but I think I will and see how that helps my kitties. Anyone tried castor oil on cats? I use castor oil as a foot moisturizer and every time I do, my girl comes running trying to lick it and I don’t want to give it to her before I know it’s safe. On the other hand if it’s not safe why is she so crazy about it to the point of waking up to the smell of it even when she’s asleep and running to beg? I have a problem with 2- 10 year old spoiled monsters! They, after reading all of the symtoms, are suffering from constant hairballs. I thought they had funny sick tummies from there age. I rescued them from a mud hole when they were 2weeks old and fed them whatever they would eat. Ten years later they have caviar tastes. HOW MUCH COCONUT OIL DO I GIVE THEM AND HOW OFTEN? HOW DO I OFFER PUMKIN IF COCONUT OIL IS REJECTED. Great post! Hairballs are never normal, they’ve just come to be accepted as normal because so many cats who are fed commercial diets with inferior ingredients and loaded with grains have them. Grain-free or raw diets seem to make a big difference. I like probiotics because they don’t just help with intestinal health and motility (which is the real cause for hairballs), they’re also a great general immune system booster. Ingrid, thanks so much for sharing that and the link to your blog’s related article. This is so important! Years ago I was feeding my cat “organic holistic” foods but they still had too much grain—and I had no idea at the time that those grains could have contributed to IBD that turned into intestinal lymphoma before I even knew what was going on. Oh, very painful, but so important for us all to learn! My cats transitioned to a grain free diet two years ago, one of the MANY benefits was a reduction in hairballs. I’ve tried pumpkin before, when their tummy’s were upset, but never as a regular part of their diet. That’s great Jen. I’m starting to think that grain-free may be surest cure for hairballs.